More news in from Patrick Coote of Fraser Yachts about additions to the company’s fleet of central agencies for sale. Rob Newton in Fort Lauderdale has signed up Trinity’s 45.72m Magic. Built in 1998 and refitted in 2004, she accommodates 10 guests in a master suite, three doubles and a twin and is asking $15.9 million. 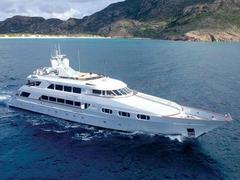 On the other side of the Atlantic, David Legrand in Monaco is now offering the 38.2m Maisha for sale. Built by Turkey’s Cobra Yatcilik yard in 2008, she sleeps eight guests in four cabins and is on the market at €12 million.